EXECUTIVE SUMMARY: This is the third in a planned series of articles to review and summarize the historic performance of selected technical indicators for hedging livestock (cattle, hogs, and feeder cattle). 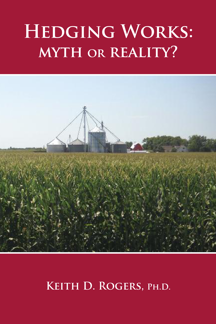 The main objective of the series is to document the comparative performance of selected indicators in a standard format to help producers choose the ones that are most likely to assist in making effective and timely price risk management decisions. A template was created in a spreadsheet format using the last 250 days of the Feeder Cattle contracts for November 2008-2012. This article reviews simulated hedging decisions using nine moving average based indicators to calculate hedging gains and losses with predetermined hedging rules. The average contract closing price for the five contracts was $117.34. All nine indicators produced positive hedging gains (commissions and fees ignored), with average hedging gains ranging from $5.04 to $10.83 per hundredweight, resulting in average hedged prices of $122.38 to $128.96. To make the transition from grains to livestock as smooth as possible, the first three articles in the livestock series start with the same nine technical indicators that were used in the grain studies. All nine indicators are in the moving average group, and would be considered as trend following indicators. Earlier articles have documented that the results were significantly better when the basic moving average formulas were modified to give increased emphasis to the major trend. Because similar outcomes were produced with the livestock studies, only the results for the modified formulas will be presented and discussed. For more details on the impact of the modifications, please refer back to the series of grain articles in the archives. This article discusses the results for a five year test period (2008-2012) for the November contracts for Feeder Cattle on the Chicago Mercantile Exchange. The contract is for 50,000 pounds and is quoted in dollars per hundredweight. For each contract, the last 250 days were used for the analysis. 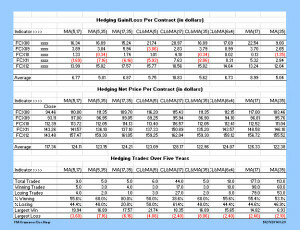 At the top of the Modified Moving Average Crossover table, the contracts are listed in the first column (FC is for Feeder Cattle, X is for November, and 08 is for 2008). The Hedging Gain/Loss Per Contract is the total gain or loss in dollars per hundredweight ($16.34 for FCX08 using MA5 and MA17). On first glance, it appears that the hedging process worked well, with eight of the nine indicators for the FCX08 capturing more than $15.00 per hundredweight (commissions and fees ignored). All nine indicators captured at least $12.00 of gain for the FCX12 contract as well. If the indicators produced this well for all of the contracts, most producers would not need to look much farther for an effective hedging strategy. However, none of the indicators produced equally consistent results for the other three contracts (2009-2011). In fact, six of the nine indicators produced negative hedging returns for at least one year, and some for two of the five years. 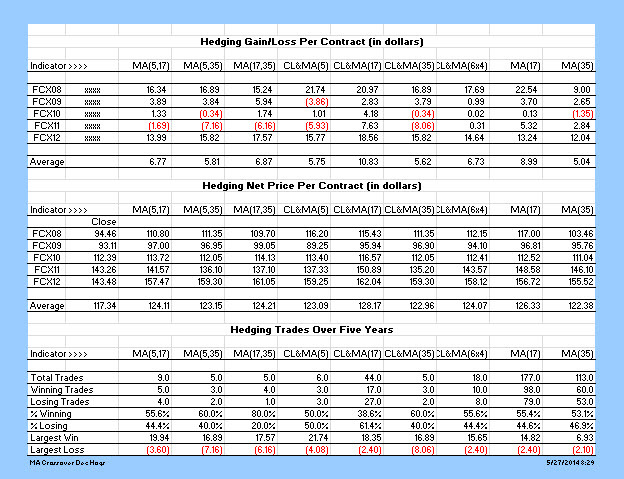 Five of the indicators produced average hedging gains of $6.73 to $10.83 per hundredweight over the five year test period. Based on an average contract closing price of $117.34, these are gains of 5.7% to 9.2%. Several of the indicators have interesting elements, but all have some challenges. For example, MA(5,35) produced an average hedging gain of $5.81 and only had two losing trades in five years. However, one of those losses was $7.16, or more than $3,500 per contract. MA(17,35) did even better with an average gain of $6.87 and only one losing trade in five years. But, again, that one loss was a sizeable $6.16. Three indicators produced a positive gain each of the five years, and averaged $6.73 to $10.83. As noted in the Trades section of the table, each had losing trades up to $2.40 per hundredweight. The devil is in the detail! Eight of the nine indicators had more than 50% winning trades, but only MA(17,35) reached 80%. Four of the indicators produced only five or six trades in five years, while one produced nine, and one produced 18. The other three jumped to 44, 113, and 177 trades. These latter numbers may be acceptable to professional traders, but would be excessive for most producers who are attempting to implement a hedging program to manage price risk. All of the indicators had one or more losing trades of at least $2.10, and some had losing trades in the $6.00, $7.00, and $8.00 range per hundredweight. These losses translate to large margin requirements, and could put significant pressure on cash flow. Selecting a “best” indicator from this set is a challenge because there are tradeoffs between size of hedging gain and the number of trades and the size of losing trades. If you can accept an average of more than eight trades per year, and single trade losses of $2.40 per hundredweight, then CL&MA(17) may be the most interesting in this set. Most producers would agree that there is no obvious “best” indicator in these nine moving average indicators. Readers are reminded that these are preliminary results, but that moving average indicators were not expected to work as well for livestock as for the grains. Readers are also reminded that the results are only for the November contracts for Feeder Cattle, and for only one five year test period. Since this is a learning site, and because there are four other families of indictors to be reviewed, it is not productive to try to go farther at this time to identify a “best” indicator Feeder Cattle for Feeder Cattle. The definition of “best” is very subjective and unique to each management team. The main focus of this article is to provide preliminary results on how effective the moving average indicators have been for hedging Nov Feeder Cattle. The secondary point is to focus attention on factors which can significantly distort the selection of a “best” indicator, such as the size and number of losing trades, cumulative losses, etc. The next articles in the series will shift to indicators based on oscillators instead of moving averages. As always, comments and questions are welcome. The easiest way is to Reply to the post on the Discussion Group page relating to Nov Feeder Cattle – MA. Posted by Keith D. Rogers on 27 May 2014.